Our dinner plans for Monday were something of a loose thread in my plans. I had originally planned that we would eat dinner at Micklethwait Craft Meats. But I had checked their hours and discovered that they had shifted from evening hours to lunch hours. So I had rescheduled them for Saturday's lunch, but never filled the hole in Monday evening. 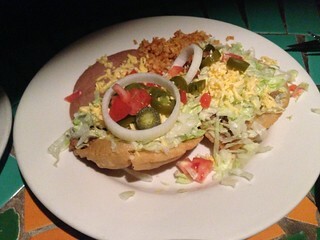 We realized that we'd given somewhat short shrift to the Mexican side of Austin's offerings; all we had eaten with Chris and Amy was a breakfast taco and the migas at Threadgill's buffet. So we called Adam for Tex-Mex suggestions, and he suggested Vivo, with a particular recommendation to check out the restrooms. 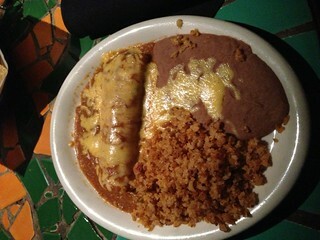 I commented on the drive over that I have trouble knowing what to order at Mexican restaurants. 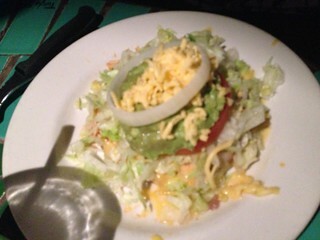 I did most of my Tex-Mex eating as a child, where I almost always got tacos. Pittsburgh has been devoid of good Mexican restaurants until the past few years, and Lori tends to be wary of spice, so I haven't eaten a lot of Tex-Mex food as an adult. Chris offered to order for the group, and pointed out that his mother was Mexican, and he had often visited relatives in San Antonio. This made me realize that I had taken a very proprietary attitude toward this trip, as if I this was particularly my state that I was showing off - and that attitude was hardly justified in Austin because I had grown up two hundred miles away. I tried to double-check all the things I'd said on this trip to to check whether I had crossed the line from proprietary to patronizing. I didn't identify any examples, and I dearly hope there were none. Our outdoor table was very sharply lit, such that the table was in an island of light but it was hard to see the other people at the table. 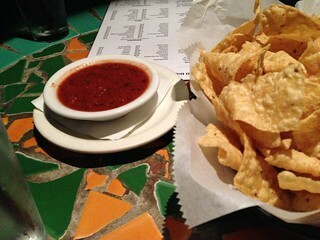 The salsa was very good, but the chips were even better; they tasted like they were straight from the fryer. 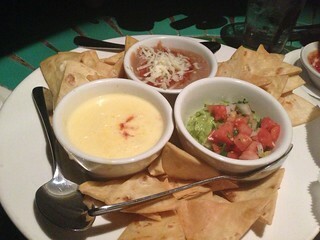 The trio of dips we had ordered as an appetizer (queso, bean dip, guacamole) were each very tasty. 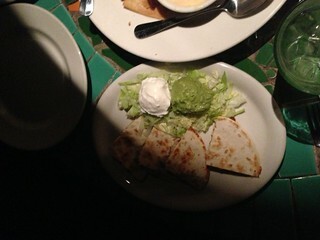 We ordered the chicken quesadilla out of consideration for Lori’s spice tolerance. But I think this was the star of the entrees; it had a really sumptuous flavor. I’ll admit, though, that it probably doesn’t need the drama of the sharp shadows, like a brooding Batman posing as a quesadilla. 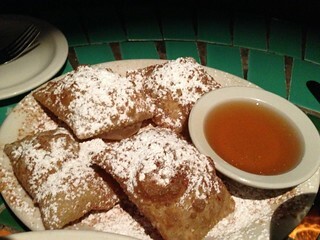 For dessert, we had a plate of sopaipillas that may have interbred with beignets. The other particularly noteworthy thing about Vivo ws the exaggerated sexual dimorphism of the restrooms. (Adam had recommended that we be sure to see the restrooms.) The walls of the mens’ room were coveredwith graffiti and graffiti art in a Latino style, but Lori and Amy reported that the women’s room had velvet-upholstered lounges and a crystal chandelier. After Vivo, we went to Donn’s Depot. 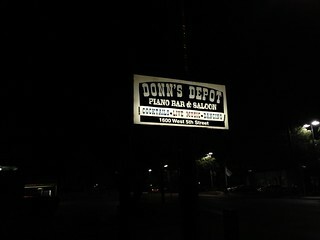 Adam had recommended Donn’s Depot second after the Broken Spoke when I asked him for honky-tonk recommendations. He said that the particular distinguishing virtue of Donn’s was that often when he went, he would be the youngest person there. I had included it in our schedule because I wanted to do some honky-tonking while Chris and Amy were with us. Adam had also mentioned the women’s restroom here as worth a view. The report from Lori and Amy was less enthusiastic; it was built into a caboose, but otherwise not outstanding. Unfortunately, this was the wrong night for Donn’s Depot. Instead of the usual entertainment, there was a cheesy piano bar entertainer, and the music just wasn’t good at all. This is probably why there was only one other table occupied. We had a token drink and left as soon as we felt we could politely do so.